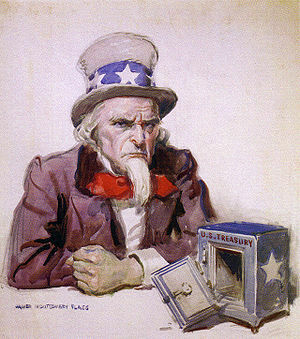 The National Debt: How Soon Before Uncle Sam Cries "Uncle?" From the beginning of this past March, bond mutual funds have received a net inflow of some $214 billion. The comparable total for U. S. equity mutual funds is “just” $10.5 billion, or less than 5% as much. And so the real question must be asked: why are investors so willing to buy bonds paying little if any interest which will be redeemed in dollars that will be worth less than they are now? And why, especially, are the Chinese so willing to play this losing game? Are they just ignorant? Are they really hoping to get their money back in the future, with the same purchasing power? On a recent Saturday Night Live skit, a bawdy but delightful parody about President Obama’s recent trip to China appeared. Although crude, this skit makes it plain what everyone knows: China ISN”T going to get its money back. And if the audience knows it, then everyone knows it. And if everyone knows it, then perhaps it’s a “game” of musical chairs, with the participants hoping they’ll be able to quit the game before they run out of chairs! Or perhaps something much more troubling. The U.S. is not alone in inflating its currency. China has been growing its money supply enormously in order to cheapen its currency, to keep Americans buying their goods and to keep their massive workforce employed. And so they have a “chip in the game”, and they know it. What happens when the music stops? Ask Great Britain. In spite of its global empire, a powerful military, and an enviable position at the center of world-wide commerce, in early 1946 the British government faced a serious risk of defaulting on its financial obligations. [And so] it asked the U.S. for a loan of $5 billion. To the surprise and shock of the British, Washington refused. Great Britain must end its “system of imperial preferences” which meant no more tariffs and duties on goods to and from colonies such as India. By accepting these conditions, Great Britain essentially acknowledged the end of the British Empire. A tipping point can be applied to a process in which, beyond a certain point, the rate at which a process continues will increase dramatically. The budget of the United States has reached a tipping point. A recent event could have, in fact, marked that point in time. The first Baby Boomer — born January 1, 1946 — has applied for early retirement at age 62 and has just received her first Social Security check. On the chart, an upturn in the Medicare growth rate can be detected in 2011 when the first Baby Boomers reach age 65. Thereafter the number of retirees continues to increase while the number of workers per retiree continues to decrease. With America’s continuing Greater Recession (not reflected in the presentation of course), that “tipping point” with China could occur a lot sooner. Reduce benefits. Allow this to happen salami-slice by salami-slice in order to reduce the pain. Raise taxes. The tax cuts passed under the Bush administration will expire in 2010 under the Obama administration, resulting in an increase in taxes without any legislation required. Further additional taxes are proposed, to “reduce” the deficit. Borrow more. Musical chairs (see above). Cut spending. Being Keynesians, the economists advising the Obama administration are recommending the opposite. Enhance growth. If the limitations placed on government by the Constitution (and sworn to be upheld by each member of Congress) were followed, the free enterprise system (the greatest engine of economic growth the world has ever seen) would be unleashed. This entry was posted	on Wednesday, November 25th, 2009 at 8:08 pm	and is filed under Economics. You can follow any responses to this entry through the RSS 2.0 feed. You can leave a response, or trackback from your own site.